The 2007-2008 men’s soccer season would be the best on record in school history. 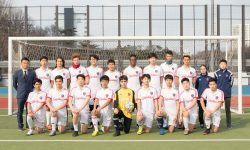 In addition to a 21-4-1 record, the Guardians would boast a 2nd place finish in the KAIAC season and tournament as well as another Far East Championship banner. The guys had a great year, driven by the vocal and determined senior captain Jonathan Kim. While the guys still couldn’t quite get by rivals SFS, it was their best year to date. The championship game between YISS and SFS was much anticipated and was a hard fought match ending in a 1-0 loss for the Guardians.